Scandinavian home design is readily recognizable with its simple beauty that is also functional and practical. The Scandinavian beach décor reflects this and takes advantage of the sea elements in its design. The base design for building your décor is one of simple elegance that utilizing form and function. There a few specific design aspects and elements you need to incorporate in your décor to create a Scandinavian home, especially a beach cottage design. The big colors in this design style are white, off white, gray and blue. You can use a large spectrum of these colors. In addition, the colors of nature play a significant role when you want to add a bolder pop of colors, such as a medium russet hue or a green-blue color. Behr's Champagne Wishes that's a light golden tan. Canvas Luggage that is a light tan hue and comes from Behr. Scandinavian Sky by Pittsburg Paints is a soft blue-green hue with a tinge of gray for the perfect Scandinavian color choice. Smoke Screen, also from Pittsburg Paints, is a great gray color choice. Scandinavian Blue is a deep clean blue by Benjamin Moore. In her book Paint Recipes: A Step-by-Step Guide to Colors and Finishes for the Home, Liz Wagstaff discusses the Scandinavian color palette and its growing popularity in home decors. She states that "The misty, cool blues and greens of those northern landscapes" are "spiked" with various earth tones. She describes how the fine Scandinavian furniture craftsmanship emerged as a result of the long harsh winters when the farmers were unable to do much of anything else. These colors make it into beach cottage palettes. Painted wood floors that are light colored, either white or gray will grasp the authenticity of a Scandinavian beach that is reminiscent of weathered driftwood. Wood floors can be used throughout your cottage. Some people like to use a blue or gray tile floor in bathrooms. Other people prefer tile floors in the kitchen. Just be sure your selection is in keeping with that specific Scandinavian look of function and style. 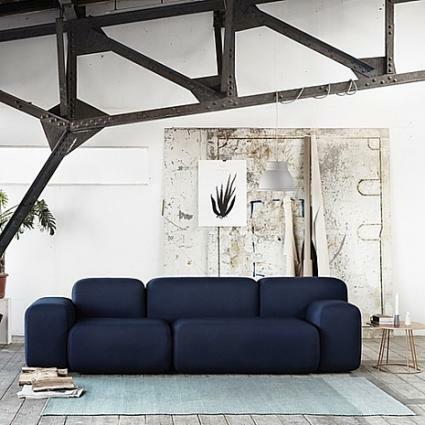 You can also add a Muuto Varjo Rug or two. Kronoswiss Noblesse Nordic Ash laminate flooring resembles wood planks. Armstrong's Bayside Nordic Linen Vinyl Sheet Flooring has a realistic texture in light neutral colors. Kahrs Original Scandinavian Naturals offers blond colored engineered wood flooring, Ash Gotland. Tarkett Floors is a Scandinavian flooring company with wood and vinyl flooring that's regionally sourced and is available in the U.S.
You can't go wrong with wood cladding also known as paneling for the walls. If you have an older cottage with dark pine paneling, then give it a good white or gray paint job. If you don't have paneling then you may wish to add this authentic touch to your home. Wood cladding (paneling) is also a popular for ceiling designs, typically narrow strips similar to flooring. The architectural style of the high-pitched roofline found in Scandinavian designs just begs for this type of wall and ceiling treatment. While the wall and ceiling paneling is often painted, some designs use a blond colored stain finish instead. Gustafs Linear Planks can be installed in traditional vertical style or more dramatically with horizontal or even diagonal placements. You can also use these planks for ceiling paneling. Elmwood Reclaimed Timber gives an excellent choice using reclaimed wood paneling. Wood Naturally provides real wood paneling with different types of wood, finishes and designs. Don't forget to decorate your walls with some spectacular wall art to reflect your personal likes or even add a pop of color to your overall room décor. Scandinavian Art can add to your home decor. Starfish Wall Art offers a cute way to introduce the beach theme into your overall design. This Sand Dollar and Starfish Wall Sculpture is a whimsical addition. While IKEA is often a go-to source for Scandinavian designs, you can expand beyond this well-known brand for cabinets and household items, including furniture. Houzz offers quite a few excellent choices of furniture and other furnishings. Some of the great Swedish and Danish furniture designers, such as Hans Wegner (Wishbone Chair) and Arne Jacobse (Series 7™), lend authentic pieces to your décor. 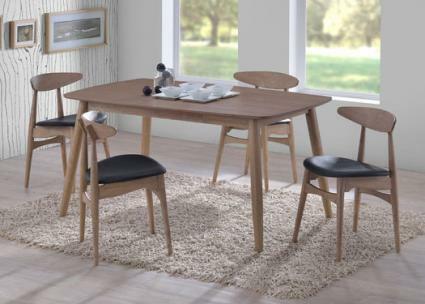 Wegner is especially well-known for his Danish Moderism style that blends comfort and design; he has world-renowned styles like the Shell Chair that would fit into a beach style. Don't forget the designs by Finnish architect and designer, Alvar Aalto and shop at his online store. Fjords Ergonomic Recliner Chair Models by Hjellegjerde is a classic look for a den or home office. Scandinavian arm chair from Joss & Main can be used in a den as well in a dining room or home office. Harlow Mid-Century Modern Scandinavian Sideboard Storage Cabinet sold by Hip Modern Home is an excellent choice for a beach cottage. Carmela end table from Sleek Modern Furniture can become a centerpiece for your classic look. Lighting design is another area where the Scandinavians excelled in the 20th century. Home Building & Renovating in the UK suggests that lighting is also a very distinguishable design element for the Scandinavian style and points to Poul Henningsen's designs that were created for Louis Poulsen. Utilitarian designs hat have great lines for a clean look are lighting choices in keeping with this style. Keep in mind that many industrial lighting styles work well with Scandinavian interiors. Muuto Unfold pendant light is made from silicone rubber has a great look and is available in Scandinavian colors. Artcraft Scandia Wide Brushed Nickel Pendant Light will look perfect over a kitchen bar or other room where a pendant light is needed. Artcraft Scandia Brushed Nickel Floor Lamp will give a den or home office the right touch for your beach cottage. Jamie Young Dove Gray Stockholm table lamp can give a darker accent color to a bedroom, den or home office. Scandinavidan Design Center offers a large selection of appropriate lighting designs. There are other features you'll want to include in your design to make it feel more authentic. When you begin to put all of your selections together, make sure you keep it a cohesive design. The key to a successful Scandinavian beach cottage décor is simplicity. Don't add too much furniture and accessories. Adopt a minimalist attitude and be very selective in what you add to your design. Cluttering your rooms with a lot of wall art and knick knacks will destroy the look you want to achieve. 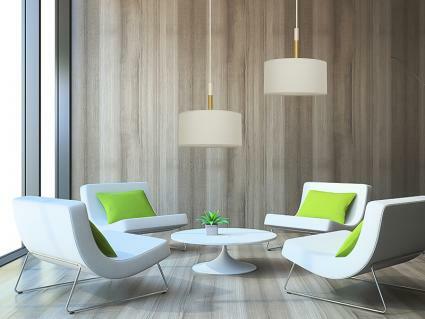 Clean lines that are sleek, linear or curving are ideal for your furnishings. You want to adhere to the Scandinavian color palette. 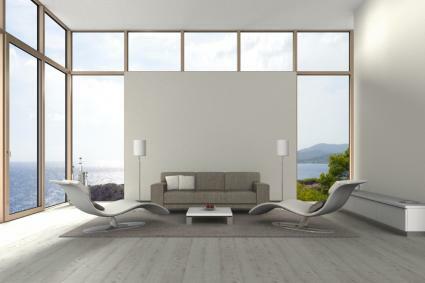 White walls and white or gray floors are always excellent choices. You can introduce a pop of color if you feel your decor needs more with blues, browns and other earth colors. Choose colorful accessories, rugs and beach-themed throw pillows for fun additions. Keeping a crisp clean decor that is airy and cool is your overall design goal. The winters are long and brutal in Scandinavian countries and a wood-burning fireplaces are a must, even on the beach. If you don't wish to deal with wood, then you can always opt for a gas log insert for an authentic appeal. You may choose to purchase a stand alone fireplace with an emphasis on radiant heat properties. The Malm Fireplace is a free-standing fireplace that has the modern retro look expected in a Scandinavian décor. You can achieve this very special Scandinavian look for your beach cottage with these simple tips and suggestions. Your cottage will something you enjoy as a refreshing retreat.